M4ID invited global health experts to Helsinki to innovate new solutions to newborn healthcare in low-resource settings. New approaches are greatly needed: while we have seen impressive steps in child and maternal health globally, the survival of newborns has lagged. Chunks of cardboard, lego bricks, ribbon and post-it papers are spread on tables throughout the workspace. Lively discussion fills the room. 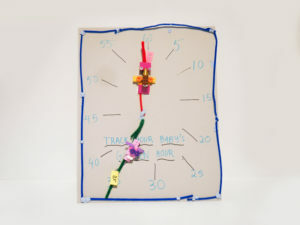 During the day, cardboard pieces gradually take the shape of boxes and papers the form of a wall clock. We have reached the third and last day of the newborn design sprint, and have begun prototyping the ideas to enhance newborn health in low-resource settings. “It is unique to bring technical medical professionals together with people from different disciplines. I never thought about how well this group of people could churn out ideas and make things happen”, says one of the participants, Ghana-based nurse and midwife Cheryl Jemmott. 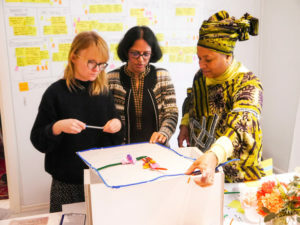 She was one of the six global health experts who took part in the Newborn Design sprint in Helsinki last week. As part of our Newborn Exploration project, we brought the expertise of neonatologists, midwives and maternal and newborn health experts together with M4ID’s design skills. We also shared factors identified to impact newborn health gathered from fieldwork in Nigeria, India, and Cambodia. M4ID’s Development Specialist Jenni Hämäläinen, Dr. Suman Rao, Professor and Head of Department of Neonatology at St. John’s Medical College Hospital, and nurse, midwife and physician Cheryl Jemmott working together. A design sprint allows a small team to progress from an identified problem to tested solutions or prototypes. The aim of the sprint was to explore new solutions in neonatal care and to strengthen the application of existing evidence-based interventions. During the three days the experts and M4ID staff exchanged experiences with challenges, ideated new solutions and turned them into quickly testable hypotheses and rapid prototypes. As a group, sprint participants evaluated ideas based on feasibility of their implementation and potential impact. These included the promotion of the golden hour, the crucial skin-to-skin contact time, and a baby home care kit, given to parents after leaving the birthing facility. This is where the boxes and clock come in. However, good ideas alone are not enough. “One must emphasise that no effort must be spared to make sure that these ideas reach our people,” says Bukola Fawole, a gynaecologist and obstetrician from the Maternal and Child Health Institute at the University of Ibadan, Nigeria. There are many good solutions that have not been taken up by facilities or the users. This is where human-centred design shows its important value – ensuring solutions developed are tailored to meet local needs and requirements. The “Golden Hour” is the hour after birth where skin-to-skin contact between mother and newborn is crucial. This time is often interrupted which may impact on the initiation of breastfeeding, bonding between mother and baby, and other health issues. This may have an impact on the initiation of breastfeeding, bonding between mother and baby and cause other health issues. One of the prototypes of the design sprint was a clock visually showing the activities to follow during Golden Hour. -The Newborn Design Sprint was organised on 13-15 February 2018 in Helsinki as part of M4ID’s Newborn Exploration project. -The participants were global health experts, neonatologists, paediatricians and midwives working in low-resource settings. -The next steps are that all the ideas generated during the sprint will be collected and documented. It will be identified which ideas can be tested in current and future work streams.